For nearly every American-born player, the route to the NBA is college basketball. 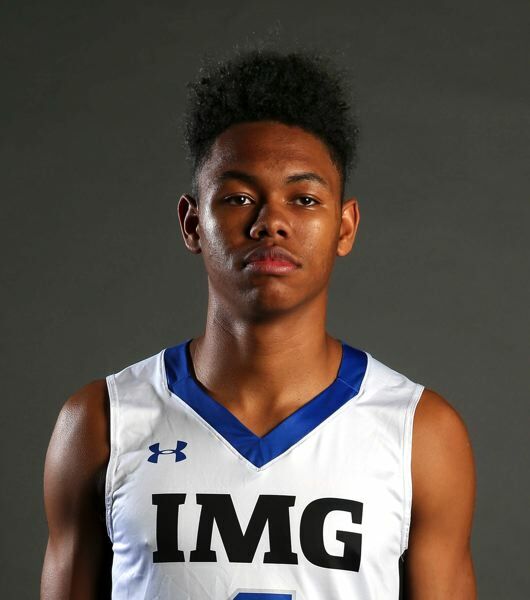 Not so for Anfernee Simons, whom the Trail Blazers made the 24th pick in the June draft. The 6-4 guard from Orlando chose to attend IMG Academy in Bradenton, Florida, for what is referred to as a "gap" year of post-graduate work after high school in 2017-18. Simons, who turned 19 on June 8, became the second player to be drafted directly out of high school as a post-grad. The first was Indian center Satnam Singh, a 2015 second-round selection by Dallas. The 7-2 Singh, who also attended IMG Academy, played two seasons of D-League ball before returning to India last year. Seven previous IMG grads have been drafted, and four of them have gone on to play in the NBA — Renaldo Balkman (2006-12) and current players Jonathan Isaac (Orlando), Dwight Powell (Dallas) and Chris McCullough (Washington). All of them, though, played at least one year of college ball. Simons, a high school graduate, and 6-5 guard Eric Ayala were the best players last season on the IMG Academy post-grad national team that went 23-9 playing other academies and junior-college opponents in a schedule that included national tournaments. Ayala narrowed his college choices to Maryland, Oregon and Miami before choosing the Terrapins, for whom he will play next season. Before his senior season at Orlando's Edgewater High, Simons committed to Louisville. He de-committed in September 2017 after then-coach Rick Pitino was placed on administrative leave over recruiting violations. Simons wound up receiving financial aid to attend IMG, which began in 1978 as a tennis academy but now covers eight sports and has an enrollment of nearly 1,200 boys and girls ages 12 to 19. Simons spent seven months at IMG, from August 2017 to March 2018. (He then worked out with a trainer in Miami for six weeks prior to the NBA draft). At IMG, Simons flourished in a structured environment in which he took a pair of college classes, played with the school's post-grad national team and focused on athletic and personal development. "The main goal with a lot of the kids is to get college exposure," said John Mahoney, who coaches IMG's post-grad national team. "Anfernee and Eric didn't need that. At our level, the speed of the game is a lot faster than in high school. It helps close the gap between high school and college. It will be at another speed next year for Anfernee (in the NBA)." A typical day for Simons would have him up at 7 a.m. for a shootaround prior to breakfast, a college class before lunch, basketball practice, physical conditioning and athletic and personal development before dinner and then free time until 10 p.m. bedtime. Simons entered IMG Academy slight of frame. "Some kids want to develop their bodies," said Brian Nash, IMG's director of basketball. "That was a big thing with Anfernee. He needed to get a little stronger and get another year of competition under his belt." • A nine-month academy featuring 21 coaches and 15 teams — 12 boys, three girls — and covering middle school through post-grad. At the highest level, there are a junior national team, a high school national team and a post-grad team. • Pre-NBA draft and college training. • Week-long camps 52 weeks of the year. • International team training. The Puerto Rican national team recently visited for a two-week session. "I try to have a pulse on everything," Nash says. "Not all of the kids are at the elite level, but the talent rises to the top." Mahoney has been with IMG for six years, the last five as head coach of the post-grad national team. "My goals are simple," he says. "I want to win. I want to be competitive. I want to help get these kids better. A lot of them are trying to get D-I scholarships." Simons — ranked as the No. 7 overall prospect in the 2018 college recruiting class by 247 Sports — moved beyond that with a season in which he averaged 22.4 points, 6.7 rebounds and 3.1 assists while shooting 54 percent from the field and 45 percent from 3-point range. "Anfernee is a dynamic player, a big scoring guard who can shoot it with range," Mahoney says. "He can score in multiple ways." DJ Andreoli has been the mental conditioning coach at IMG Academy for 10 years, working primarily with basketball and lacrosse players the past few years. A staff of 10 in the mental conditioning departments covers the academy's various sports. "My ultimate goal is to help (the athletes) perform to the best of their ability in any situation — practice, regular competition and high-level competition such as playoffs," Andreoli says. Andreoli has a weekly session with players representing three of the academy's basketball teams — the post-grads and two high school-age teams — covering a variety of topics in a classroom. Andreoli also spends a couple of hours a week on-court with coaches in a practice setting. "I might catch a player between drills and make suggestions based on what I've seen," he says. "If he's not locked in (mentally), if he's dragging during a practice, we'll take a moment to get him to focus on improving that drive and energy." Charles Gooch has been a leadership coach at IMG Academy for 2 1/2 years and has been head of the department since February, working with athletes from all the sports, including Simons. "We have discussions with them about their natural leadership ability," Gooch says. "We talk about what it takes to become a good leader. We focus on character, not just athletics. We tell the kids, 'Your next game could potentially be your last, but what does your character say?' We emphasize establishing an identity, on connecting with teammates and the fans and their community. "I also discuss the subjects of inspiration and empowerment, of communication through mainstream and digital media, along with non-verbal communication. I do a series called 'Building Men of Character.' We talk about manhood, respect for self, respect for others, respect for diversity, respect for women, respect for authority." All four IMG employees wound up impressed by Simons. "He's a nice kid doing all the right things," Andreoli says. "He's a quiet young man, a really decent kid who did most of his talking on the court," Gooch says. "I'd see him around campus. The little kids who would visit the campus were always in awe of him and the other post-grad players. During the games, the fans would come out to see our version of 'Dunk City.'" Mahoney and Nash got to know Simons well. "Anfernee is a humble kid who mostly keeps to himself, doesn't boast," Mahoney says. "You won't find him out on the town partying. He's a homebody who likes his video games." "He comes from a great family," Nash says. "With some of the higher-level kids, a lot of baggage goes along with it. Not with Anfernee. He came to work every day. Credit to him for how hard he works. When you have the coaching and the facilities we do, you have to maximize what we have. When that happens, it tends to become a nice fit." Simons was a nice fit at IMG Academy. Next question: Will he be an immediate fit in the NBA? "That's a tough question," Mahoney says. "This is a big summer for him. He's been working hard since he left us in March. His people are working him hard. Every day, he's going to get bigger and stronger. I think he'll be a good NBA player. I'm just not sure how soon it will happen." Through five games at the NBA summer league in Las Vegas, Nevada, Simons averaged 11.8 points and 3.2 rebounds in 20.8 minutes per game for Portland, shooting .444 from the field. "His talent translates to the NBA," Nash says. "But he's a young kid now playing against grown men. When you can pass, dribble and shoot the way he can, it gives you a chance to make the transition quicker. "In Portland, he has great guards in front of him. He'll work hard and do whatever he has to do there. Once his body develops, you're going to have a really good player."